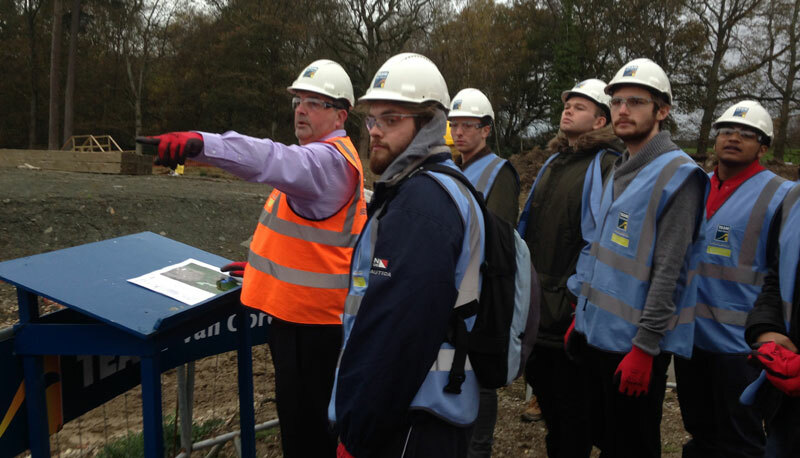 Students from the University of Brighton have benefitted from ‘real life experience’ though a visit to a civil engineering site in West Sussex. In early November a group of students visited the Clays Lake site, near Pease Pottage, where flood prevention works are being carried out by Mackley working as part of Team Van Oord*. Dave Knapp, Business Development and Marketing Manager at Mackley, said: “Around 18 months ago I was invited to join the local Industrial Advisory Board which is based at the University of Sussex. “The Board’s purpose is to forge links and partnerships between the university and business and industry, to both enhance students’ learning experience and make an important contribution to their successful development. “I agreed to arrange a series of visits to our sites to give the students ‘real life’ civil engineering experience. The works at Clay’s Lake are being carried out as part of the Upper Mole Flood Alleviation Scheme which was developed by the Environment Agency after floods in the Crawley area during 2000. The works comprise the removal of an existing dam which is being replaced with a larger dam. This will increase the lake’s capacity from 10,000 cubic metres to nearly 400,000 cubic metres, thereby reducing the risk of flood during periods of heavy rainfall. Associated works include the excavation of a ‘borrow’ area to provide materials for the new dam, and mitigation measures including the creation of a pond and tree pruning. The site visits are being organised in partnership with Dr Maria Diakoumi, Senior Lecturer in Civil Engineering in the School of Environment & Technology at the University of Brighton. Terry Gretton, Mackley’s Project Manager at Clay’s Lake, said: “The students were on site for most of the day and took a great interest in the work we are undertaking. In addition to organising the site visits, the Mackley team has also made a series of presentations at the University on issues relating to sustainability and environmental awareness on civil engineering sites. Team Van Oord is a Joint Venture partnership between Van Oord, Kier Group, Mackley and Royal HaskoningDHV who between them have a combined turnover in excess of £1.8bn.